My son has severe brain damage caused by a common virus, cytomegalovirus. This virus unknowingly attacked his brain while I carried him inside of my own body for 9 months. My son cannot sit up. He cannot walk or talk or roll over. He cannot hold anything in his hands. He has uncontrolled epilepsy, including a rare form of epilepsy called LGS and is in a full time state known as SESE. I will leave you to research those yourself as Minister of Health. He is in palliative/hospice level care. My son…my first born child…will not live to see his late teens, if even to see next year. Yet, despite all of the above, my son is on a waiting list to see his new paediatrician for the first time. You see, we moved from Kilkenny to Kildare in late February and since then he has been without any consultant care simply because we moved to another county a bit over an hour away. And Mr. Harris, despite all of the above, my son cannot even be put on a wait list to see a new neurologist regarding his seizures and medication until he first sees his new paediatrician. And yet again, despite all of the above, I cannot get a portable oxygen unit for him here at home until he sees the new paediatrician because for some asinine reason, neither the GP nor his Life Limiting Illness Nurse with the HSE can order something as basic as life-saving oxygen for a child such as him. It has been suggested to me by members within the medical community that the next time my son Brendan has a seizure, that I take him into the hospital ED where his new paediatrician is located just so I can get him seen to earlier…hopefully. And, hopefully he will get a neurologist on his case as well. Guess what, Mr. Harris? I will be doing just that the next time he has a seizure because unlike the current health care system (HSE), I actually want to help make my son’s limited life as painless as it can be, keep him as healthy as he can be, and have him not have to struggle and suffer any more than is out of my control. Do you want to do that for him, too? Do you care? Two weeks ago Brendan had yet another grand mal seizure. His respirations became very slow. His blood oxygen sat rate plummeted. At 3 minutes, per protocol, I administered the rescue medication into his stiff, convulsing, fragile body while I prayed this would not be the time I lose him. Thankfully, it wasn’t. Not this time. But it will be no time again before he has another major seizure, and then what? There is no oxygen to give him here. His medication levels can’t be readjusted until he sees a neurologist. He can’t see a neurologist until he sees the paediatrician and that won’t be at least until November, a wait of 9 months simply because we moved to Kildare from Kilkenny. I do not want to hear again that “Ah well, that’s just the system in Ireland. Sure it’s a disaster but what can ya do.” Yes, it IS a disaster, a total disaster, but hear this, Mr. Harris: I will NOT have my son’s death be from something preventable and as a result of a shameful, disaster of a health care system! Now, what are you going to do to change this situation and the HSE as a whole? Oh, please make note of this, too: I can assure you, my son is not the only child out here suffering as a result of all that is wrong with the health system. So, what say you? I sit here on a hotel bed while looking at the beautiful view of the river Slaney in Ferrycarrig, County Wexford. I have been taking a few days of respite while my son Brendan Bjorn is at the LauraLynn Children’s Hospice being cared for so that I can attempt to recharge my severely depleted batteries. It is day 2 of 3 days respite and at this point I am not so sure my batteries are even at 30% yet. Yeah, the past week has been THAT tough. And this time, it isn’t Brendan’s health that is shaking me to my core. It is my other son’s health…my “healthy” son. And, it is my own health. My youngest son hasn’t been himself lately, so I took him in for blood work. We thought it could be diabetes, but those levels turned out fine. Instead, I received a call last week from the nurse saying the GP wanted me to come in to discuss what they did find. My heart sank. Nothing can be wrong with my little boy. He’s the one I can count on always being typically healthy, after all. He’s not the one for whom I’ve made a DNR and funeral plans. He’s not the one who is severely disabled and has a life-limiting illness. Yet, here I am now, left terrified at the unknown, now having to wait another month until we repeat the blood work and see if the results show the same skewed levels in this particular way. And if they do, then we will have to probe further…is it a hereditary blood disorder? bone marrow? cancer? I just have to wait to find out. The wait is tearing me apart. Inside, I feel like my own future has been tossed into the air, spinning, diving in a free-fall that can’t be stopped until the time comes when the doctors can say “Your son is perfectly fine.” Then I will breathe. Until then, I am only pretending. In the midst of this scare, my own health has become a concern as the GP put me on a blood pressure monitor for 24 hours after having high readings for the past few weeks and related symptoms for the past few months. It turns out that I do indeed have high blood pressure. I’m not sure who missed the memo, but this just isn’t allowed and was not part of the plan. I mean, I’ve got to be able to care for my son. Both of my sons. No, this is not part of the plan. The memo must not have been clear. All joking aside, far aside, it has left me doing some very long and hard thinking during the past few days. People say not to ask “what if” but when you have a child with a life-limiting illness, you learn to ask even past the “what if” and into the realm of 3 or 4 or even 5 possible options of “what ifs” and sort out the answers for each scenario. Parents on this journey tend to plan while living daily on the edge of uncertainty. It is one of our many superpowers. What if my heart gives out or I have a stroke? Then what would happen? What if my other son, God forbid, is very ill indeed? 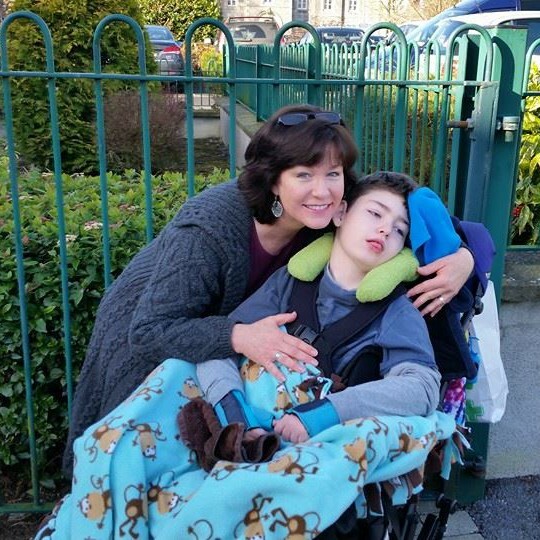 What if I am left unable to physically care for my severely disabled son Brendan? The list of “what ifs” is currently unending. And so, I plan. Just as the Mommy on the plane in trouble who must put the oxygen mask on herself before she places it lovingly over her baby’s mouth, I must get my health sorted out as quickly as possible. If it means blood pressure medication, so be it. And I must also start taking better care of myself on all levels. This is a definite wake up call. Next, my youngest son. God knows at this moment I don’t know what to do. I don’t think there is anything I can actually do, at least not until more testing is done. Until then, I will try to remember the lessons learned from my precious son Brendan – that some things in life are just out of my control; that some things in life I simply cannot change; and so, all I can do is wait to see what happens. Then I will do everything I need to do, and then some. No one ever said it would always be easy. But life is always worth it. Every single beautiful, painful, joyous, heartbreaking, amazing, tragic, breathtaking moment.